Ace the ABOG MOC exam with the best OBGYN Recertification course online. Over 1,000 case-based ABOG MOC written exam questions + ABOG AMA PRA Category 1 CME Credits™. Ongoing Obstetrics & Gynecology MOC convenience & utility. Easy to use. Over 78,000 OB/GYN physicians served. Take care of the OBGYN Recertification exam. Or take care of it all, forever. We also offer ABOG Qualifying Exam Review and an OB GYN CME course. Ace Obstetrics & Gynecology exams with the #1 Online ABOG MOC Written Exam Review. 100% Pass-guaranteed ABOG OBGYN Recertification Course. 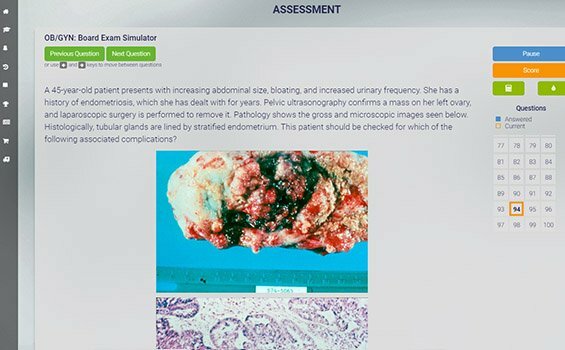 Med-Challenger offers the most exam-focused content and OBGYN MOC exam questions. The ABOG Maintenance of Certification (MOC) process was developed to enable physicians to maintain a high standard of current medical knowledge and safety. In each year of the 6 year cycle ABOG Diplomates must complete a number of tasks including reading current literature and answering questions about the content, and performing a quality improvement activity. In selected years specific training in medical safety is included, and once each cycle a secure, written examination must be passed. In addition, ABOG carefully reviews all adverse actions against physicians as Diplomates are required to hold and maintain an unrestricted license to practice medicine. Earn MOC Points & CME credit while you study. Knock out requirements fast. Try these OB GYN Practice Questions from our Question of the Week blog. No risk. Pass the OBGYN boards, guaranteed. Satisfy OBGYN MOC requirements too. Best Obstetrics and Gynecology Board Review? Our obstetrics and gynecology board review follows the ABOG Model. Proven effective for American Board of Obstetrics and Gynecology (ABOG) Initial Certification, and maintenance of certification requirement compliance, our OBGYN board review follows the exam content outline for the American Board of Obstetrics and Gynecology Examination and OBGYN Model giving you more than 1000 OBGYN board review practice questions with detailed explanations peer-reviewed by practicing OBGYN educators. Intelligent, time-saving adaptive learning and prescriptive remediation produces the best review in the shortest time. Dashboards, custom exams, and other career-minded MOC utilities are also included. Our proven Obstetrics and Gynecology board review (99.8% pass-rate) follows the OBGYN Model and the exam content outline for the American Board of Obstetrics and Gynecology (ABOG) Examination. What’s more, with 98 AMA PRA Category 1 CME Credits™ built-in, Med-Challenger’s OBGYN board review Qbank, gives gynecologists and obstetricians everything needed to ace OBGYN exams and fulfill MOC requirements year after year with less time, labor, and worry. Med-Challenger’s OBGYN Board Review offers the best ABOG review options. Join the over 78,000 OBGYN practitioners who’ve used Med-Challenger to outperform on exams – and protect their practice. Try it for free today.